Once upon a time, I worked for a company called IBM, and lived in a city called Tokyo. One of my roles there was to drive the adoption of social media (inside the firewall). I spent a whole lot of time thinking about, observing and participating in online conversations – and came to see the value of them as this: you learn. And that’s the main reason I started this blog in January. I was passionate about the issue of food waste, though I only had a little bit to say about it – maybe enough material for an entry or five. But I knew that through the act of writing, I would come to think more deeply about the subject, and start to connect with people who would push me in new directions. I was excited at the prospect of finding those people, and those directions. Two of those people turned out to be Shannon, who writes dirt n kids, and Nicole Brait, who writes The Sustain Blog – both of whom recently received nominations for the Kreativ Blogger Award and the Versatile Blogger Award, for obvious reasons. Shannon writes with humor and warmth about the things she’s passionate about (dirt & kids). She also manages to raise 4 kids without generating more than a small bag of trash a week. Nicole writes about a variety of sustainability topics, and has made me consider things I would never have thought of, like raising bees (although we have no yard, which I guess is a show stopper). All of these are ones I check out regularly (though there are many more). Some have been nominated before, but I just wanted to highlight them here for those with similar interests. And some would not consider Grist a blog per se, but it is built on WordPress, so I decided it could be included. I’m a fan of sci-fi – and have written a few SF stories and one screenplay (all of which I hope to sell one of these days). I serve at the pleasure of Edo & Pyx, two feline foundlings from Kanagawa Prefecture in Japan – and once spent 8 weekends enlisting the inhabitants of a small Japanese village in a massive (and ultimately successful) search for Edo, who was lost far from home. Mac. Not PC – though I did like OS/2 in it’s day. I have a real passion for photography. I started sharing some travel pictures and stories online on Geocities in 1999 to show our families what we were up to in Asia, and have been sharing pictures on flickr since 2005. These days, I am consulting in Singapore about ⅓ of the time, and am in a state of perpetual jet lag. I hope to spend more time writing, speaking, thinking, and doing something about food waste and other issues I care about, and am looking for ways to do that. It’s time to make a difference. I have reason to believe that I’m being stalked by royalty. 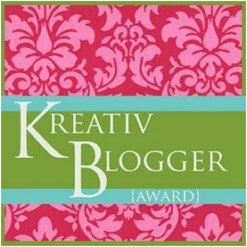 This entry was posted in Asides and tagged award, blogger, kreative, versatile by Jean-François. Bookmark the permalink. I had to come back and comment…busy day today. Last few weeks of school. 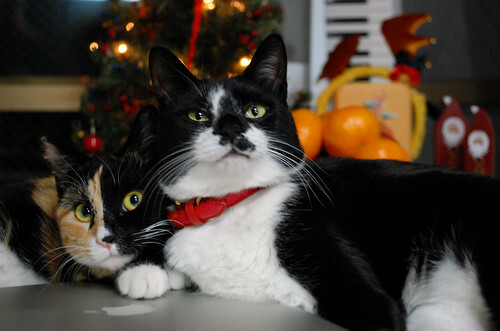 Love, love, LOVE your majestic kitties. We used to have two Japanese Bobtails (from US breeder) that have recently passed. Maneki Neko is what they call them, I believe, and my girls to this day will rub the paw of any one that they see, like at the sushi place (for good luck). RIP, Keiko and Roi. I would love to explore more of your photography. My interest is piqued!! Keep up the great work here — you are making a difference. Thanks, Shannon … I caught Edo-chan (the young lady in the foreground) in a rare majestic moment here. She generally comes off as kind of goofy and scruffy. Pyx is the bobtail, and manages to be adorable and bossy in the same breath. Anyone who thinks cats are aloof should hang out with them for a few days. There are over 2500 of my pictures at the flickr link – so lots to explore, if you’re so inclined – and of course millions of other people’s pics. Love the site, as there are so many incredible images and talents to find. Thank you for the nomination! I really enjoy your site – you open my eyes to all sorts of ways to avoid food waste creatively and deliciously. And “the bosses” are adorable! Thanks – will pass that on to the bosses (though I suspect that they’re perfectly aware). Thanks so much for the nomination and mention. I always love to read your thoughtful comments on my ramblings. With your own nomination It was great to learn a bit about you. I know that Conner over at Nourish ‘knows’ you a bit from some convos – and speaks very highly of you – so to know find out about your gorgeous cats (I am confirmed cat and hen person), travelling and IT guru ways is most enlightening. I am Mac-ified too. Actually, it’s thanks to you that I know Conner – so thanks for inadvertently introducing us. And cats and hens sound like a dangerous combination. Though, now that I think of it, I’m not sure who I’d be more afraid for if a hen got loose with Edo & Pyx. Think any hen with street smarts would win that skirmish. Oh, my cats know who are the bosses – the hens. I think they know what damage a well-placed talon could do. When we first got them they eyed them up but they seem to co-exist very peacefully, without any ‘arguments’. Conner is a sweetheart, isn’t she? A good person to know. I should probably pick your brain sometime soon regarding blog redesign, hammering out what I need and don’t need. Follow on – not a hint to do a design for me, just that you would know what would be right from a social media point and getting my self out there a bit more. She definitely is … and my brain will be available for picking when I am back in the US, the week of May 28. As I mentioned, I was focused on enterprise social media, but I may accidentally have insights into other areas. Thanks for visiting my blog. I came by to check out yours and love it! I am a big fan of Grist as well. 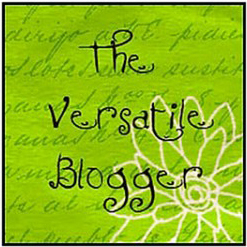 Sustainable living and self-sufficiency is my latest obsession, so your blog list is a treasure-trove! Thank you for sharing.